"It is inevitable that man will one day live among the stars" Inevitability is a game where you can build a space empire! Collect materials to craft parts and build your very own fleet of starships and stations block by block. Manage relations with eight factions spanning four alien races. Mixed (32) - 43% of the 32 user reviews for this game are positive. 1.20 Update is out. Science! Science! Science! Hey guys It has been awhile. We have a cool update that just went out that added a long requested feature of being able to research new parts. You can see all the parts you have researched already and research new ones from the new research menu by spending "research points". You can get research points from the new part type of labs that can go on stations to generate passive science points. Even without labs you will slowly get points over time. Added new part type: Labs. Changed background image as it was very small and you could see the tiling. Fixed bunch of font issues with sizing and placement. Fixed you being able to make broken saves from the tutorial. Fixed Tech parts not saying what they do. Fixed Bug with parts rotating. This mainly effected the blue laser. Upgraded to the latest Version of Freaking Sweet (our game engine). 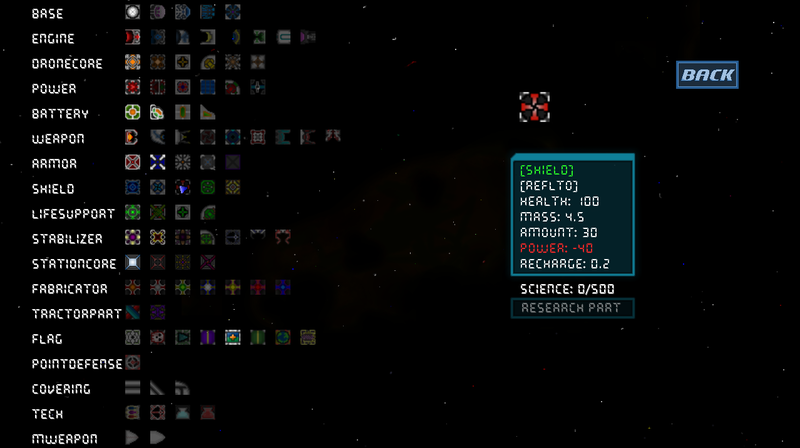 Inevitability is a game where you can build your own starships part by part in a massive randomly generated universe. With eight different factions spanning four alien races you can help them or plunder them for scrap and new parts! Sandbox mode- Explore the cosmos with unlimited resources and no threat of being raided by angry factions. Community Ships- Upload your ship in the ship building menu and others will see your ship exploring the cosmos in a future update! Technology Tree- Upgrade your fleet of star-ships and stations with new parts that you find throughout the universe. Play the game how you want- If you want to be an economic powerhouse making smart trades for new parts and drones that mine for your automatically or a ruthless space pirate that kills everything it comes in contact with you can do it! New free updates constantly- We plan on supporting Inevitability with new features for a long time and have some big plans for future additions. From the community- Extremely receptive to the community. Every one of our updates includes some features either inspired by the community or directly from them. We love hearing for you guys!